Today will start the 40th session of UNESCO’s World Heritage Committee where the state of Conservation of Virunga National park will be discussed. The World Heritage Committee comprises representatives from 21 States Parties to the Convention concerning the Protection of the World Cultural and Natural Heritage (1972). Virunga was designated as a World Heritage site in 1979 and was inscribed on the List of World Heritage in Danger in 1994. Why is this important for the future of Virunga? 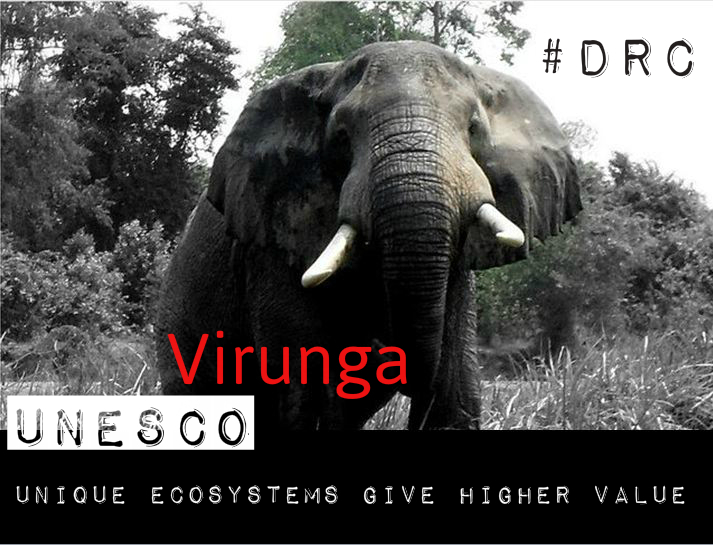 UNESCO World Heritage Convention has been one of the only International binding agreement protecting Virunga from oil exploration and exploitation. In June 2015 “UNESCO’s World Heritage Committee reiterated its position that oil, gas and mineral exploration or exploitation are incompatible with World Heritage status. The 40th session is important for Virunga because it will not only monitor the state of conservation of properties inscribed on the World Heritage List but it has also the function to decide which properties included in the World Heritage List are to be inscribed on or removed from the List of World Heritage in Danger; and can even decide whether a property may be deleted from the World Heritage List. If Virunga came to be deleted of the World Heritage list, it will mean no more legal protection against oil exploration and the lost of a protection status that has made the survival of Africa’s oldest National park a reality in the biggest of the adversities. Losing Virunga will also put the existence of all the other national parks in DRC and World Heritage sites in Africa at risk. Notwithstanding the catastrophic consequences for the future of millions of peoples that depend on the resources of the park and its healthy ecosystems. In 2016 no formal request on the part of the Congolese authorities to declassify a part of the park has been presented to the committee. However the new DRC Hydrocarbons Code adopted in August 2015 provides the possibility of declassifying protected areas including World Heritage properties in order to conduct oil exploration activities. In addition, the State Party indicates that it may also solicit an advisory mission to study the possibility of amending the boundaries of Virunga National Park. Although petroleum activity has not been observed, it must be emphasized that petroleum exploration continues to threaten the integrity of the property. The State Party has still not confirmed the cancellation of the petroleum concessions that encroach the property and has not confirmed its commitment to no longer authorize new petroleum explorations or exploitations within the property. In a call for tender concerning the attribution of petroleum exploration concessions at Lake Edward, the Republic of Uganda has decided to include the Ngaji block that is located in the Ugandan part of Lake Edward and borders the property. Lake Edward is mentioned several times in the Statement of Outstanding Universal Value (OUV) of the property. Consequently, the decision to open the Ngaji block to petroleum exploration is likely to impact on its OUV and could have negative impacts on the hydraulic system of the Lake. Both the DRC and Ugandan governments have not firmly committed not to authorize any petroleum exploration or exploitation covering the park and the whole Lake Edward, which makes the oil threat a very clear and present danger for the survival of Virunga. All this is key for the long-term survival of the park and for the development of sustainable economic alternatives based on Virunga’s universal outstanding values that will benefit directly millions of Congolese and Ugandans. On 5 February 2016, the State Party submitted a report on the state of conservation of the property, available at http://whc.unesco.org/en/list/63/documents. A study carried out at Lake Edward shows that the fish stocks remain important, but the tendency is to overfish. Although petroleum activity has not been observed, it must be emphasized that petroleum exploration continues to threaten the integrity of the property. The State Party has still not confirmed the cancellation of the petroleum concessions that encroach the property and has not confirmed its commitment to no longer authorize new petroleum explorations or exploitations within the property. It has not yet transmitted the results of the seismic prospection undertaken in 2014 by the SOCO Society. It is recommended that the Committee reiterate its request to the State Party to cancel the petroleum concessions granted in the property as well as to confirm its position according to which petroleum exploration and exploitation are incompatible with World Heritage status. In a call for tender concerning the attribution of petroleum exploration concessions at Lake Edward, published on the official Internet site of the Petroleum Directorate of the Ministry of Energy and Mineral Development (MEMD), the Republic of Uganda has decided to include the Ngaji block that is located in the Ugandan part of Lake Edward and borders the property. With regard to this alarming situation, the World Heritage Centre wrote, on 24 August 2015, a letter to the Permanent Delegation of Uganda to UNESCO, recalling that Lake Edward is mentioned several times in the Statement of Outstanding Universal Value (OUV) of the property. Consequently, the decision to open the Ngaji block to petroleum exploration is likely to impact on its OUV and could have negative impacts on the hydraulic system of the Lake. On 26 February 2016, the Director-General of UNESCO also addressed a letter to the President of the Republic of Uganda, informing of her concern regarding the attribution of this petroleum block. On 25 May 2016, the State Party of Uganda responded to the second letter, recognizing the environmental sensitivity of the Lake Edward Basin and noting six actions that have been implemented by the State Party to ensure that oil and gas activities in the region do not have a negative impact on the environment. Among the listed actions it is noted that a Strategic Environmental Assessment (SEA) for oil and gas operations in the entire Albertine Graben was undertaken, the recommendations of which guide decision-making in the petroleum sector. It is recommended that the Committee request the State Party of Uganda to submit the report of this SEA to the World Heritage Centre, for review by IUCN. However, on 1 March 2016, the MEMD published a press statement indicating that of the seven societies that had submitted offers for the different blocks to be attributed, none had shown an interest in Ngaji. It is recommended that the Committee express its deep concern regarding the possible attribution of the Ngaji block and that it reminds the State Party of Uganda of Article 6.3 of the Convention. It is also recommended that the Committee urgently request the two States Parties concerned to strongly commit not to authorize any petroleum exploration or exploitation at Lake Edward. Improvement of the encroached areas and the increase of the populations of key species (gorillas, hippopotamus, elephants) is encouraged. However, some actions of the invaders, that encourage encroachment, are worrying as they could compromise the result achieved in the community conservation framework. It is therefore recommended that the Committee reiterate its request to the State Party to implement the commitments undertaken in the Kinshasa Declaration of January 2011, in particular the peaceful evacuation of the illegal occupants in the property. It is recommended that the Committee encourage all the initiatives of the “Virunga Alliance” and that it warmly welcomes this innovative initiative which aims to support economic development based on ecosystem services. The European Commission, in the framework of its support programme of 11th EDF (European Development Fund), will provide substantial support amounting to several tens of thousands of Euros to the park over the period 2016-2020. Insecurity is a continuing problem and the efforts of the State Party to demobilize the rebels and integrate them into the FARDC are commendable. It is recommended that the Committee warmly welcomes the fact that the patrols were able to maintain a 75% surveillance of the park, and that the military operations against the armed groups continue, and it conveys its sincere condolences to the families of the guards and the military killed during operations to protect the property. It is finally recommended that the Reinforced Monitoring Mechanism continue to be applied.